Płock - the Tumskie Hill over the Vistula River. listen) is a city in central Poland, on the Vistula river. According to the data provided by GUS on 30 June 2009 there were 126,675 inhabitants. It is located in the Masovian Voivodeship (since 1999), having previously been the capital of the Płock Voivodeship (1975–1998). It now is a capital of a powiat (county) at the extreme west of the Mazovian Voivodeship. In years: 1079 - 1138 Płock was capital of Poland. Płock is also a historical capital of Mazovia. Płock was the capital city of Poland during the reign of the Polish monarchs Władysław I Herman and Bolesław III Krzywousty (1079–1138). It was also a seat of several of the Dukes of Masovia and one of the capitals of that state. 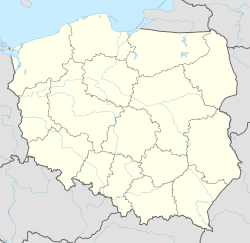 During the German occupation of Poland (1941 to 1945) it was named Schröttersburg, after the former Prussian Upper President Friedrich Leopold von Schrötter. The Duke Capital City of Płock (Polish: Stołeczne Książęce Miasto Płock) is the official title of Płock used in ceremonial documents and for preserving traditions. It is the formal legal title included in the preamble to the City Statute of Płock. The title is a result of the fact that from 1079–1138 Płock was the capital of Poland. It performed this function during the reign of the Polish monarchs Władysław I Herman and Bolesław III Krzywousty. Formerly, during the rule of the first monarchs of the Piast dynasty, even prior to the Baptism of Poland, Płock served as one of the monarchial seats, including that of Prince Mieszko I and King Bolesław I Chrobry, the latter of which raised the original fortifications on Tumskie Hill, overlooking the Vistula River. From 1037–1047 Płock was capital of the independent Mazovian state of Masław. Płock has been the historical capital of Mazovia (region of Poland), the residence of many Mazovian princes, and is the oldest town in the region (town rights in 1237). It is also the oldest legislated seat of the diocese, with the Cathedral in Płock built in the first half of the 12th century and housing the sarcophagi of Polish monarchs. The cathedral in Płock is one of the five oldest cathedrals in Poland. This site is the main seat of the Mariavite bishops. Their most important church was built here in the beginning of the 20th century - it is called Temple of Mercy and Charity and is situated in a pleasant garden on the hill on which the historical centre of Płock is built, near the Vistula river. The Jewish presence in Płock dates back many centuries, probably to 1400. In 1938, almost 25% of the population was Jewish, making Płock one of the cities in Poland with the highest proportional Jewish presence. The Jewish population of Płock was destroyed by the Germans during the Holocaust. Herman Kruk, a notable chronicler of life inside the Nazi concentration camps and Holocaust victim was born in Plock in 1897. The main industry is oil refining. The country's largest oil refinery (Płock refinery), and parent company, PKN Orlen are located here; it is served by a large pipeline leading from Russia to Germany. There are several industrial activities connected with the refinery, such as servicing and construction. There is also a Levi Strauss & Co. factory in Płock. Bus service covers the entire city, with 41 routes. PKS Płock - Przedsiębiorstwo Komunikacji Samochodowej w Płocku S.A.
^ "Get to know Płock". From official Płock website.en. http://www.ump.pl/en/main.php?cid=poznaj&iid=getknow. Retrieved 2011-02-17. ^ Kassow, Samuel D.. "Vilna Stories". http://www.eilatgordinlevitan.com/vilna/vilna_pages/vilna_stories_kruk.html. Retrieved 31 December 2012. ^ "Städtepartnerschaften und Internationales" (in German). Büro für Städtepartnerschaften und internationale Beziehungen. http://www.darmstadt.de/standort/staedtepartnerschaften-und-internationales/index.htm. Retrieved 2013-07-26. This page uses content from the English language Wikipedia. The original content was at Płock. The list of authors can be seen in the page history. As with this Familypedia wiki, the content of Wikipedia is available under the Creative Commons License.